PLA 3D850 filament is designed and based on resin made by the prestigious company Nature Works, specially thought out for 3D printing applications as it has better mechanical properties than ordinary PLA. 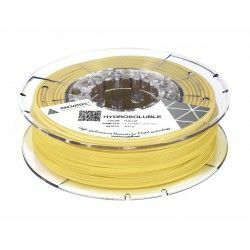 This filament is designed and based on resin made by the prestigious company Nature Works, specially thought out for 3D printing applications as it has better mechanical properties than ordinary PLA. Its high crystallization let you increase the printing speed over a 50% than other materials. Besides, this property makes this material ideal for printing complex pieces with a very high resolution so you can appreciate the smallest details. Because of its improved mechanical properties, such as impact, bending and tensile resistance, you can get strong and stiff pieces as well. Print easily a lot of kind of models with a higher printing speed than other materials. You will not end pieces with warping as this material does not have contractions, so you will be able to print high resolution models with a good surface finish. The PLA is a biodegradable plastic due to its natural origin (corn, sugarcane or potatoes). In addiction, it is one of the most easy to print materials in the 3D printing world. High quality material specially designed for medical applications. 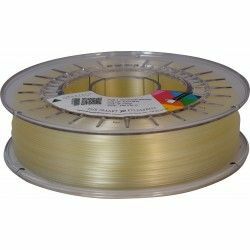 This filament has the USP class VI or ISO 10993-1 certification, with this certification it guarantees that this filament is biocompatible with the human body. WOOD First class PLA with a high percentage of natural Wood, it does not incorporate recycle material or recuperated. Excellent printing resolution.